Minimal, yet absolutely stunning. The Karlsson Vintage Round Glass Clock offers class and beauty like no other. Take advantage of its sleek retro design and have it adorn your beautiful living room space. It comes with a polished effect, enhanced by the gorgeous chrome embossed numbers. It's also great for your home office or study area. You can even get this as a present for a friend or someone special. 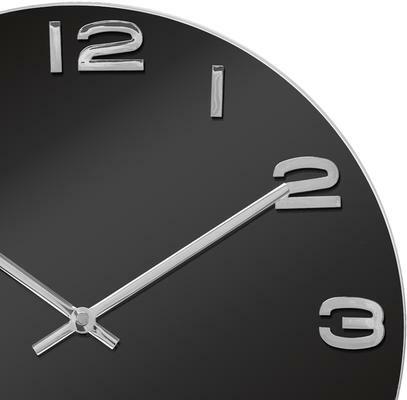 The clock measures 35 cm in diameter and perfect for modern homes, looking for a touch of elegance. This item is sold and dispatched directly by Red Candy. 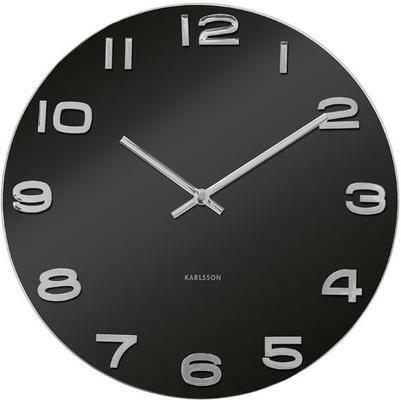 Karlsson is a Dutch clock brand renowned and sold throughout the world. Karlsson has put together a unique collaboration of national and international designers who work together with the Karlsson clocks creative team to bring high quality, eye-catching graphics, aesthetic shapes, and ground-breaking clock design to the world. Timeless Collection: This collection includes clocks that are have something timeless about them. These are the kinds of clocks that are not dependent on trends nor on their specific design or materials used. These clocks may stay in the collection for many years. Time of Your Life Collection: This contains fun pieces which add contemporary design to your home or office. They relate to changing trends and come with decided colours and shapes and add humour wherever they're used. Karlsson Works Collection: This collection includes the top line of Karlsson’s clock products which stand out with their technical and design features and are totally unique.